There’s something about this combination of deep jewel tones accented with gold that just oozes luxury! 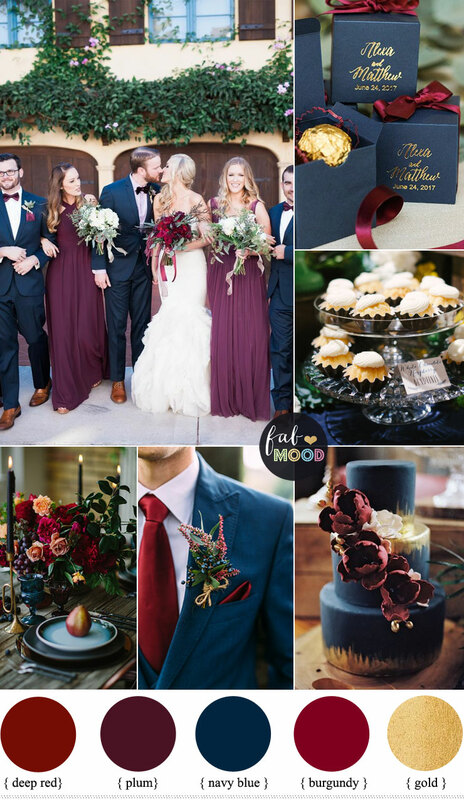 If you’re like me and are attracted to rich, dynamic and bold colours, consider a plum, burgundy and navy blue wedding palette for a fall or winter wedding. Here are some ways you can utilize them in a variety of ways to fulfill your dream wedding theme. Plum ,burgundy and navy pair beautifully together and are a great way to bring together the feminine and masculine elements, namely the bridesmaids’ gowns and groomsmen suits. 2016 has been a big year for the modernization of the navy tailored suit, and we’ve seen them in everything from boho casual weddings to replacing the tux at black tie events. Plus, these two tones are complimented by earth tones, so pairing a navy suit with brown shoes is super chic! 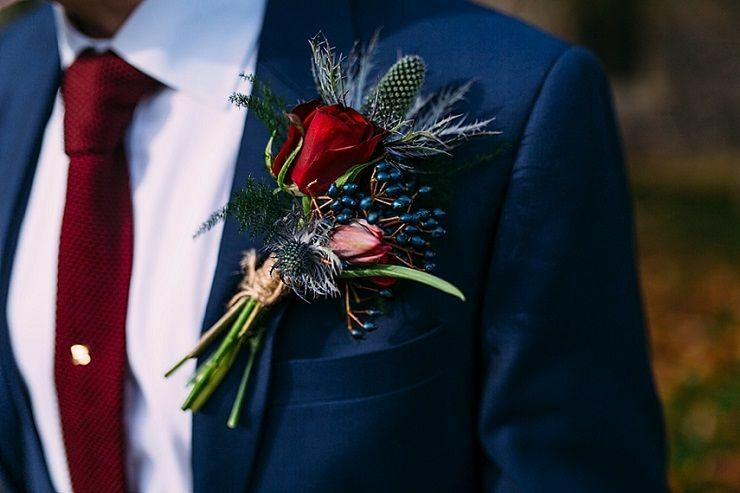 I love a classic blue three piece suit with dark red tie and pocket square sets off this magnificent buttonhole. 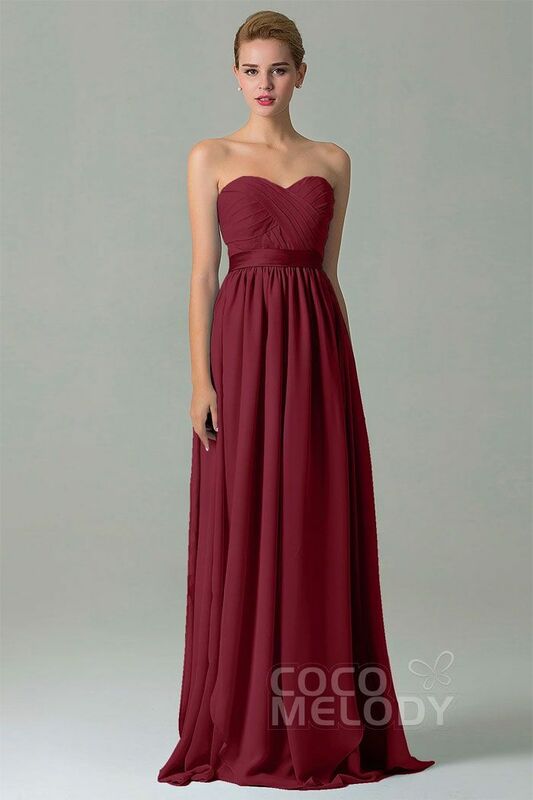 For Bridesmaids either strapless or one shoulder dress…more ideas for burgundy bridesmaids that make your fall wedding stand out. As an additional accent colour, burgundy and deep red can skirt the line between bold and traditional, not to mention being a traditional colour associated with romance. Its inherent elegance pairs perfectly with gold accents and rich earth tones, like natural wood if you’re going for a rustic theme, or gold candelabras and place settings if you are looking for a luxe affair. I LOVE the way the blend of reds, peach and plum blossoms look arranged together, and this cake takes it to a whole new level! The flowers blooming off the navy tiers of cake frosted in gold are almost too beautiful to eat! Have you read these wedding palettes and wedding ideas on Fab Mood Yet? Both are looking stunning in color full wedding dress , thank you for sharing the nice pictures and blogs. Awesome wedding style, thank you for sharing the colorful weddings effects.